Dog parks act to fulfill your dog’s needs in several different ways; socially, physically, and mentally. Socialization: no matter how old your dog is, they need some friends to play with. Exposing your pup to other pets of all sizes is part of a great socialization routine. By bringing them to play in an area where they get to meet new canine friends, they learn how to resolve conflict, play behaviors, social graces, and become calmer around unexpected occurrences. Dogs who miss out on these early and continuous doggy play sessions often become aggressive and anxious around other pets and may require further training later in life. Sensory Enrichment: Did you know, creating new experiences is the best way to keep your dog happy and engaged? Taking your dog to the local dog park will expose them to exciting scents, new textures under their paws, and they’ll have the opportunity to run off-leash. Exercise: Whether they are struggling to learn leash manners, know them perfectly, or throw caution to the wind and pretend they are a cart horse whenever the collar comes out, time off the leash is important. Dog parks are generally fully fenced to encourage pet parents to unleash their dogs with no chance of escape. This allows your pooch the chance to run full speed and expend some very pent-up energy. Even if you only do this with your dog once a week, your dog will be calmer and more able to focus on training sessions. The benefits aren’t just for your pup, but for you as well. Not only is it nice to take a break from playing tug of war with the leash, but you also get to meet other pet parents who share your passion for pets! Dog parks come with many benefits. However, there are things you should be aware of. Along with the free socialization and open playing spaces comes the possibility of injury, communicable diseases, and the likelihood of aggressive interactions. A dog park is also the perfect area to pick up an illness. Many pets come together in an area that isn’t sanitized between uses. Because of this, it makes picking up a parasite, or infection a possibility. In a March 2018 story on CBS17, several local pet parents had become concerned their dogs had picked up a contagion after visiting the Oakwood dog park. They reported their dogs vomiting in the weeks to follow with no known cause for the illness. Several pet owners had reported illness in their dogs, following a visit to the Oakwood area dog park. The owners cited the shared drinking water at the park as the source, despite efforts to keep the space clean. While the pets who became ill did not suffer serious harm, this episode just highlights the need to only bring your pets to the dog park if they are fully vaccinated and otherwise healthy. This way they can fight off any possible infections being passed around the playgroup. Another risk factor possible whenever you bring together two or more furry family members is the possibility they won’t become friends. There is also the possibility for play to become too rough for some. Dogs who generally are very friendly can have a disagreement that can result in a quick warning snarl and snap, and not all visitors to the dog park are guaranteed to be perfectly socialized. Always keep in mind that your dog could either be part of an altercation or cause a disagreement when playing with other dogs. Always be sure to have a plan in place, should a fight break out. Finally, even dogfights that do not require the first aid kit may have lasting effects on your dog. There are a lot of sounds, smells, and activity at the dog park. This can cause sensory overload, even for dogs that are otherwise well socialized. Keep an eye on your pup’s body language to make sure they are enjoying themselves. If they are crouching low to the ground, have their tail stuck between their legs, the whites of their eyes are showing, or they are shrinking from other dogs approaching, the dog park is not their cup of tea. Remove them from the area and try to find an environment that is less overwhelming for them. If you try to just make them get used to a situation that they are afraid of, your dog may develop a lasting phobia of dogs, parks, or being approached by strangers. Always make sure your furry friend is having fun before leaving them on their own. Always try to separate by size: Many Raleigh dog parks, like Oakwood, Millbrook, and Carolina Pines dog parks all offer fenced areas for both small or large dogs to play separately. Make sure all dogs are similarly sized so they are less likely to be intimidated and react with aggression. Remember to stay close until you know how your dog will interact with a particular group of dogs. That way you can help diffuse any potential escalating interactions. Pay particular attention to any new dogs that you and your dog are unfamiliar with. Want to know what an escalating dog interaction looks like? Check out this helpful (and illustrated!) resource detailing what escalating aggression might look like. 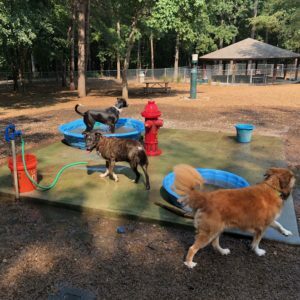 Due diligence before you unleash: While Raleigh dog parks are known for their excellent upkeep, it is important to be aware of the state of the park. Be sure to walk the perimeter with your pooch to make sure there are no gaps. Check out the posted rules board in case there is a unique rule while visiting. Make sure there are supplied poop bags before it becomes squatting time (in case they have run out). These steps are important to determine if this area is the right one to let your pooch explore. Also, check out our article on Raleigh Dog Parks and dog parks in Cary.